Sr Anne Sklenar leads the assembled Filipino Marists for their pilgrimage orientation. Members of the Marist Philippines Mission District met recently to prepare for an exciting pilgrimage and adventurous discernment in Thailand. 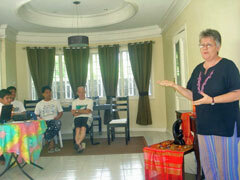 Assisted by Manila-based Kiwi Sr Anne Sklenar RNDM the Filipino Marists gathered at the Colin Centre headquarters of the mission in Davao, Mindanao. For two weeks in February ten priest members of the district will visit refugee camps in the Mae Hong Son province of the Thai-Burma border before gathering at the Marist mission of Ranong in Southern Thailand. Here they will conduct a plenary district meeting and retreat with a special focus on their missionary thrust in Asia. The group is led by District Superior, Fr Larry Sabud. The newly-built headquarters of the Philippines Mission District provides excellent faciltiies for the orientation gathering. Anointing one another with empowerment for mission is a valued part of the orientation. Australian Marist, Fr Tony Corcoran, Secretary-General of the Society of Mary, reports that Australia Day was well celebrated in Rome. 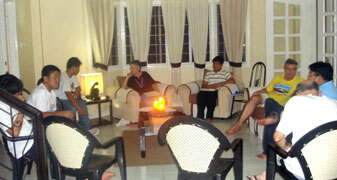 Local Aussies gathered for Mass at the General House of the Marist Fathers, 'Monteverde', before dining out locally. Grafton-born Fr Tony's term has been recently renewed ensuring that the Australian province continues to have 'our man in Rome'. He supervises the extensive secretarial responsibilities of the general administration team as well as preparating the weekly international 'SM bulletin' with administrative secretary, Mrs Sophie Janssens. "Every year in January the General Councils of the four religious branches of the Marist Family come together for a meeting. This year's meeting took place from Jan 13 to 15 in Manziana, Rome. The theme of the meeting was 'The Marian face of the Church'. There were nineteen participants, including the four Superiors General: Srs Georgeanne Marie Donovan SMSM and Jane O’Caroll SM, Br Emili Turú FMS and Fr John Hannan SM. It was an occasion to exchange in a fraternal atmosphere about everybody’s specific contributions to the service of the Church and also about the forms of collaboration inside the Marist Family. Every year the meeting proves to be very important in strengthening relationships among the leadership of the four branches of the Marist Family. Next meeting is foreseen for January next year. A special word of thanks to the Marist Brothers for their hospitality and meticulous organization of the meeting." Six young men from three Pacific countries of the Oceania Marist Province have commenced their year as Marist novices at Tutu, on the island of Taveuni, Fiji. Fr Boniface Kevon is their novice master, reversing roles with Australian, Fr Ben McKenna, who is the novitiate 'socius'. Left: The novices explore Tutu's landmarks - the Holy Cross / near Our Lady's statue at the 180th meridian 'where time begins'. 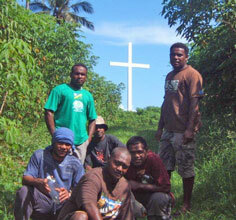 From left: Leone Balewaiyevo (Fiji), Ignatius Latu (Bougainville) and Terence Aihi (Bougainville). / Basil Ramohaisuta, Humphrey Karua and Lloyd Wegu (all from the Solomon Islands). Assembly committee, from left: Frs Bob Barber, Gerard Hall, Tony Kennedy and Kevin Redmond. The Australian Marist province's pre-assembly committee met for its initial meeting on Jan 19 to begin planning for an assembly from Jun 29 to Jul 01. An assembly is held every two to three years in the Australian province, usually in the year preceding a provincial chapter. The next chapter is scheduled for 2012. The event will take place in the 'Green Room' of the Colin Centre at Hunters Hill, NSW. Seven Marists from five provinces and mission districts have taken up residence at 'Monteverde', the general administration residence of the Society of Mary in Rome, for an eighteen-month formators' program. The course will be coordinated by Fr Craig Larkin (NZ) and will equip the participants with personal and professional skills for future formation ministry internationally. 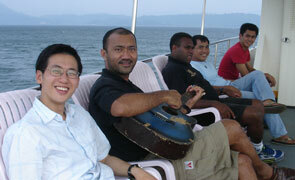 Two of the participanta, Frs Sione Hamala and Fernando Ingente, participated in the Australia province's 'The Other Half' experience in Thailand and Cambodia in 2000 and 2006-07 resp. From left: Frs Juan Carlos Pina (Mexico), John Hannan (superior-general), Albert Kabala (Africa), Roberto Furtuoso (Brazil), Didier Hadonou (Africa), Craig Larkin (course coordinator), Fabiano Naduva (Oceania), Sione Hamala (Oceania) and Fernando Ingente (Philippines). After a lapse of over thirty years the Cause for Beatification of Fr Jean-Claude Colin is being reintroduced. Fr Carlo Maria Schianchi of the Province of Europe (region of Italy) has been appointed by the superior-general as postulator of the Cause. As general archivist of the Marist Fathers he has acquired an extensive knowledge of Fr Colin and the origins of the Society of Mary. Fr Carlo Maria has a strong interest in the cause and possesses the skills and enthusiasm to do the necessary work as postulator. He has recently begun the course required for new postulators conducted by the Congregation for the Causes of Saints during the first months of 2011. In the meantime resources will be developed in Australia for international distribution to promote the 'fama' of Fr Colin in a similar fashion to the early work done promoting the cause of St Mary MacKillop. The Marist Australian province was active in promoting St Mary's cause through a series of articles in the 'Harvest' magazine in the early 1970s. Material about Fr Colin will soon appear on the Marist international web site as well as other Marist sites throughout the world. An image of the 'young Fr Colin' was painted in November last year by Sydney high school student, Shannon Smith and may possibly be used in some of the Cause material. Fijian Marist, Fr Pio Fong, is currently visiting Sydney in the hope of updating facilities at Chanel College in Apia, Samoa. Fr Pio, principal of the college, says: 'We have an acute shortage of trained teachers -- and of modern computers. Some of our thirty computers are more than twenty years old!' He would welcome gifts of computers, up to five years old, to update the I.T. lab which needs a total of sixty computers. 'We also need senior science teachers and computer teachers, too', adds Fr Pio. The college presently has three hundred students and a staff of seventeen. 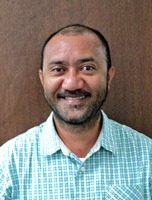 In 2006 Fr Pio studied in Sydney with the Australian Catholic University and was awarded a Masters degree in Education majoring in educational management and leadership. He was also part of the Australian Marist Mission Centre's 'The Other Half' journey in 2006-07 to Thailand, Burma, Cambodia and the Philippines. He is pictured below with disabled and refugee youth and fellow TOH-ers. The story of Kimiko Hatta and how the parish of Takada acquired their statue of Our Blessed Mother.